This tool was designed to make the SYE support team easily available to the Hyper's users. This button opens the "Get Technical Support" tab of the SYE Products Installer window. Screen share - By using this option, the user can allow Sye support team to view and take control of his computer in order to give an instant support. This tool allows us, the SYE Support Team, to assist and give explanations for every question or query of our users. In order to use this tool, select the required support agent from the list and press the Connect button. Upload file to Support Team - Upload file directly to the SYE support agent. Press the Upload file to Support Team button and select the required file. Admin Files List - When one of our support agents sends a file to a user, it can be received by using the Admin Files List button. The file will be displayed in a list of available files. This tool is used for getting support from the user's organization. This tool was designed for organizations with several agencies that require a support and screen share system between the agencies. In order to use this tool, select the required support agent from the list and press the Connect button. Here is where we inform our client with the recent updates, developments and new functions of hyper. Each new released version of Hyper is automaticaly updated in our users system at the moment of logging in to Hyper. The version number is displayed at the bottom of the Hyper's window. 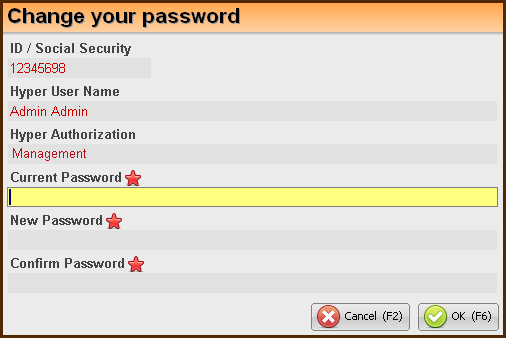 This option allows to modify the login password of the user. This window displays the users details. In the mandatory empty fields, fill in the current password and the new password (at least 7 chars). Confirm the pass word and press the OK (F6) button. Use this option to initialize the system after modifying definitions of the system. In order to initialize the system, close the Hyper's modules and windows and press this button. After initializing the system, there is no need to logout from Hyper. Use this option to create a shortcut. Select the required location for the shortcut icon. These definitions of the local computer are used to adjust it to Hyper and its requirements, in order to make its functions available for the organization's users. For further information, click here. In this window, our users can easily send us queries and report any problem or error. Use this tool to describe and detail the problem. When finished, press the Send Report to Support Team button. This document will be sent to our support team. Clear the entire list of errors. Send the App. messages log to the SYE Support Team. After sending the messages log it will be cleared.